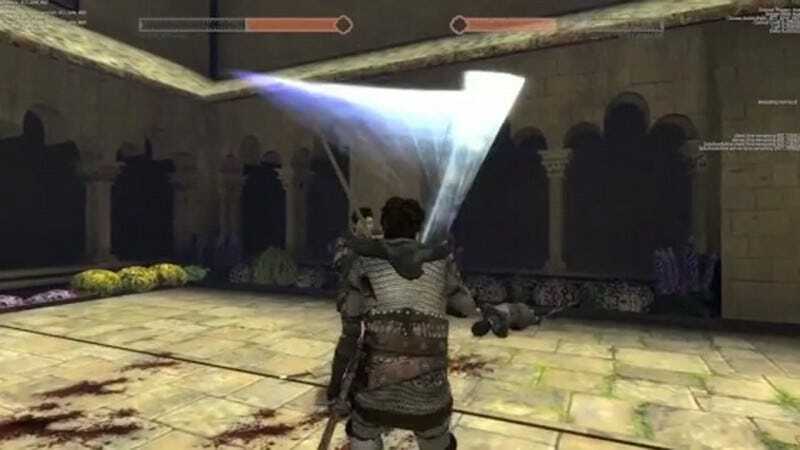 Coming into the final two days of its fund raiser, CLANG, the arena sword-fighting concept proposed by renowned science-fiction writer Neal Stephenson, was short about $50,000 of its total $500,000 goal. Overnight it made up that difference and then some, standing at about $504,000 (from more than 8,000 contributors) with more than a day to go. Why is CLANG significant? Outside of Stephenson's celebrity, his idea also has the endorsement of some big names in gaming—Bungie Studios, for one, and Gabe Newell of Valve Corporation, who brought his own blacksmithing tools to the shoot for CLANG's original pitch video. If you have yet to watch Neal Stephenson&apos;s pitch for CLANG, this story contains spoilers below. The game is planned for both PC and Mac (as it will run on the Unity engine) and Stephenson and his project team are looking to the Razer Hydra and its Sixense technology to handle the controls. "We intend to make CLANG work on any hardware that supports the same protocol," the developers say in the project's official FAQ. A Steam release is planned. No date is given, but "February 2013" was listed as the delivery time for the rewards and gifts that come with donating to the project.